Exercise. Studies show that strenuous activity dissipates stress. Get busy doing something. Meditate. Mull over the source of frustration. Do a deep think about it. Maybe combine a walk with mediation and get your exercise and deep thinking done at once. Confront. If the source of frustration violates your principles, confront it. If it’s simply a question of preferred taste or style, let it go. Keep your powder dry for the big stuff. Marketing or Sales? What should we focus on? The degree of focus is on the Y axis, and the X axis has four considerations. Price: The higher the price of your product or service, the more you’ll focus on sales over marketing. Market Size: The bigger the market you’re trying to reach, the more you’ll focus on marketing over sales. Market Type: Business to business requires more focus on sales, business to consumer requires more focus on marketing. 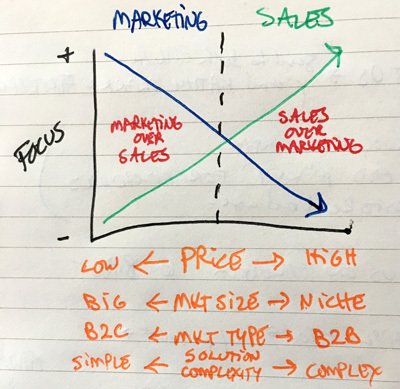 Solution Complexity: The more complex your solution, the more you’ll focus on sales over marketing. How did your company score? What should you prioritize? I hope you received the update your profile/subscribe/unsubscribe from me. I am moving these lists to a new service because I want to train a robot to reduce my work load. Don’t worry, no one is losing a job a Chambers Pivot because of AI or machine learning.